Olympian, sports presenter, public speaker, Duncan Armstrong is all these things and more. Duncan approaches everything with the same zestful attitude, the very one that helped him win gold in the Seoul Olympics… and has inspired countless others, to achieve their highest corporate and personal goals. Duncan formed a winning relationship with madcap coach Laurie Lawrence which spanned 10 years, collecting Gold at the Commonwealth Games, Pan Pacific championships and numberous national and international competitions. During his stellar career Duncan also won a host of honours out of the water, including Young Australian of the Year and an Order of Australia medal. 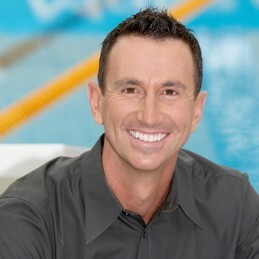 After representing Australia at two Olympic Games, Duncan retired from the pool in 1993 to pursue a career in media and corporate coaching. Duncan is currently contracted with Fox Sports and presents all their swimming coverage, as well as hosts Fox Sports Central on Sundays. Athens 2004 was Duncan’s third Olympics as a commentator, where he brought all the action from poolside with Radio 2GB. ‘Success doesn’t just happen – you have to work hard for it,’ says Duncan. ‘My career in swimming taught me that success is a process.’ Whether success is defined as a long-term corporate partnership, a positive media image or clients who themselves learn how to succeed, Duncan applies his success-oriented attitude to all areas in his life. As a result, success is achieved twice over. Duncan’s attitude makes him work hard to achieve the goals set with his clients and ensure a positive outcome – and happy clients.